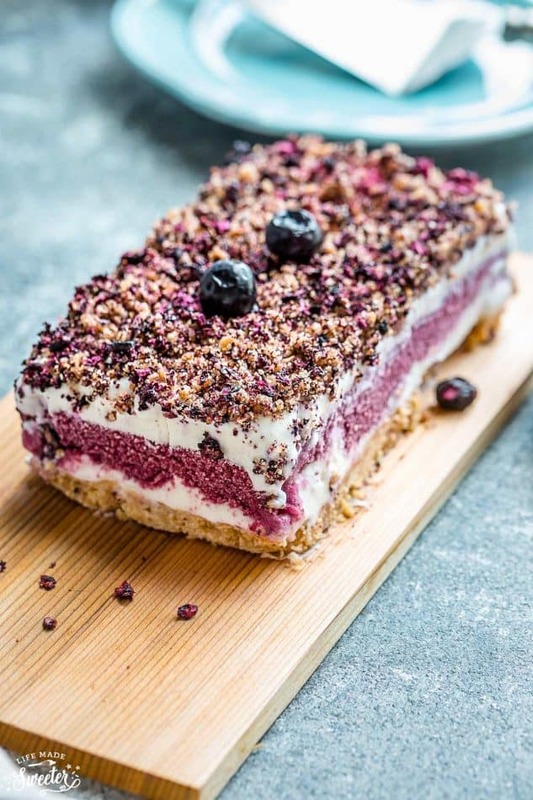 Blueberry Frozen Yogurt Bars are the perfect cool treat on a hot summer day. 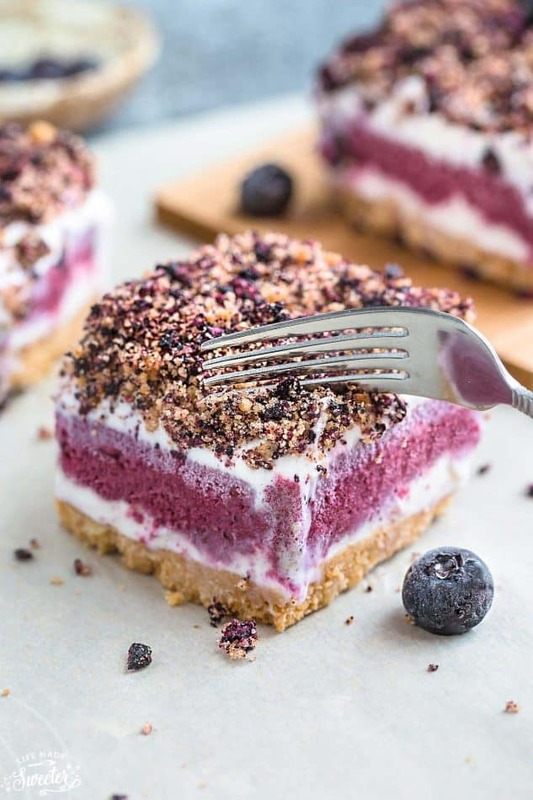 Made with delicious layers of vanilla & blueberry frozen yogurt, a crumbled shortbread topping & no-bake cookie crust. Plus recipe video! I can’t think of anything better than a cool frozen treat on a hot summer day. 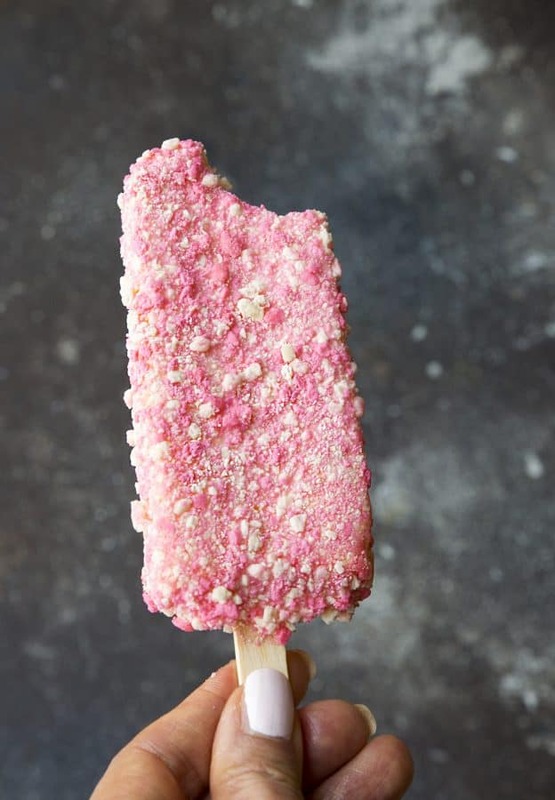 These Good Humor Strawberry Shortcake Ice Cream Bars were a favorite growing up. Anyone else remember them? They were seriously the best! I could never resist that bright strawberry center surrounded by vanilla ice cream and a strawberry crumb coating. 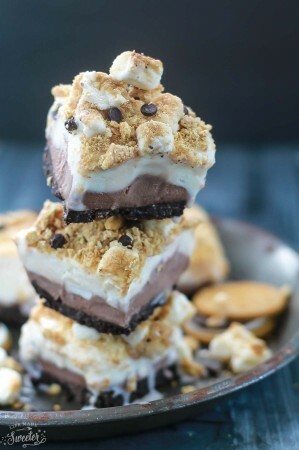 Since these Strawberry Shortcake Ice Cream Bars have been such a hit, I couldn’t wait to play around with different flavors: Lemon Cream Pie, S’mores. OMG so good! 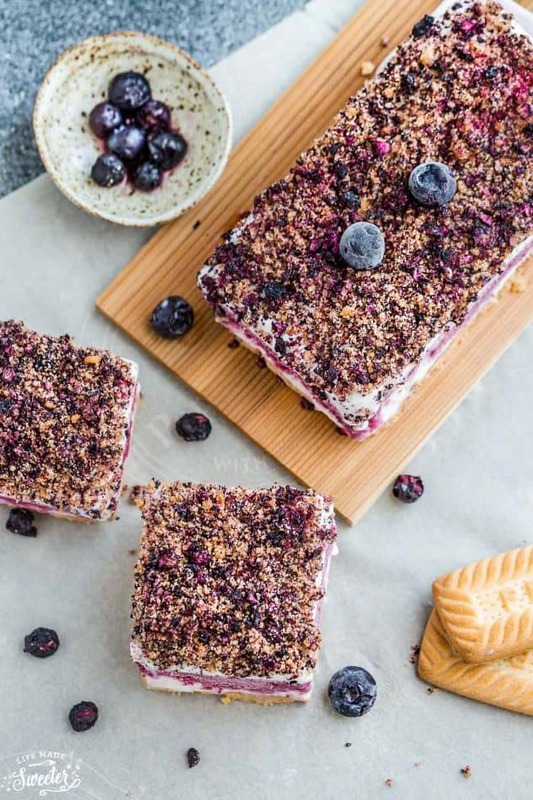 These Blueberry Frozen Yogurt Bars are our latest favorite. Instead of ice cream, I wanted to switch it up a bit by making them with frozen yogurt…and oh. my. gosh, you guys! I think I love them even more! 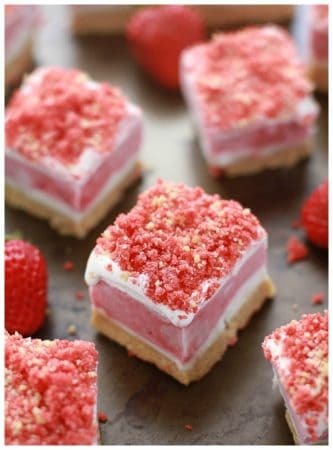 Start with a no-bake shortbread (or any other vanilla sandwich – they even have these gluten-free ones if needed) cookie crust and press it firmly into a square pan. Pop the pan into the freezer so they set up and then cut them into little squares. 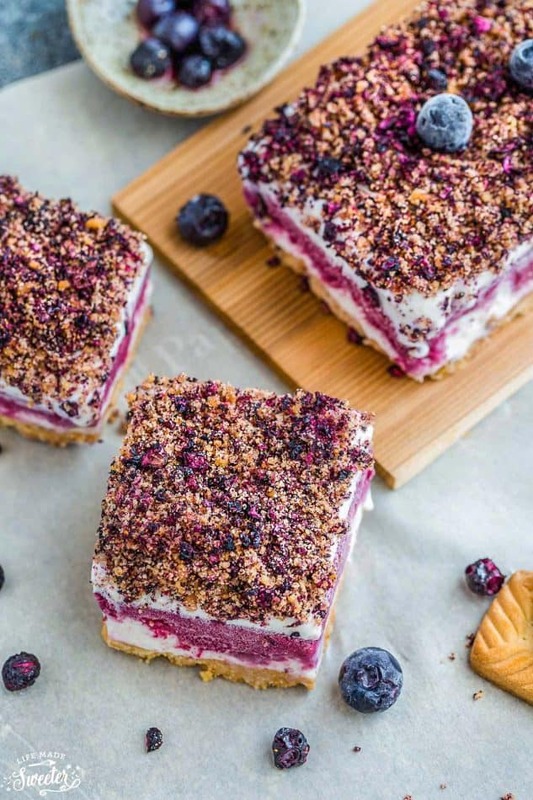 These cool and creamy Blueberry Frozen Yogurt Bars would also make a fun project to make with the kids. Or prep them ahead for your next summer party, potluck or barbecue. 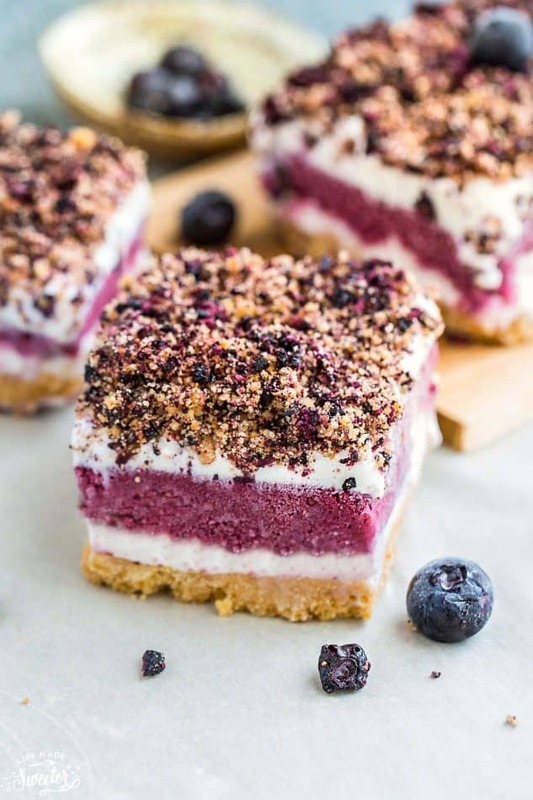 Blueberry Frozen Yogurt Bars are made with layers of vanilla and blueberry frozen yogurt, a crumbled shortbread topping & no-bake cookie crust. A fun twist on the classic Strawberry Shortcake Good Humor Ice Cream Popsicles. Make the cookie crust - In a food processor, add the cookies and pulse into fine crumbs. Add the melted butter and stir until combined. Press mixture into the bottom of lined baking dish. Place in freezer for about 20 minutes to set. 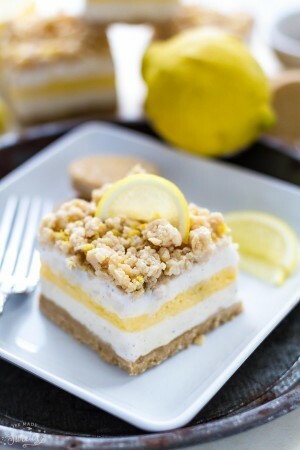 Make the crumbled topping - In a small bowl, zip-top bag or food processor, add cookies and crush into large crumbs. Mix with softened butter and press together into pea-sized pieces. Combine with freeze-dried blueberry powder (or blueberry jello powders). Set aside. Assemble - Remove vanilla frozen yogurt and blueberry frozen yogurt from freezer to soften (takes about 15-20 minutes). When ready, scoop around 2 cups of vanilla frozen yogurt over the cookie crust and spread evenly using an offset spatula. Next, spread the blueberry frozen yogurt over the vanilla layer evenly. Again, place pan in freezer for 10 minutes if needed. Add the final layer of vanilla frozen yogurt spreading evenly. 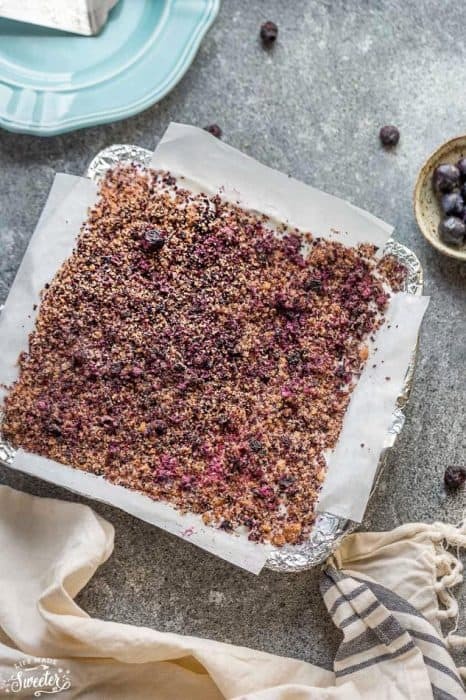 Sprinkle the blueberry cookie crumbs evenly over the bars. Place in the freezer for 3-4 hours or overnight. 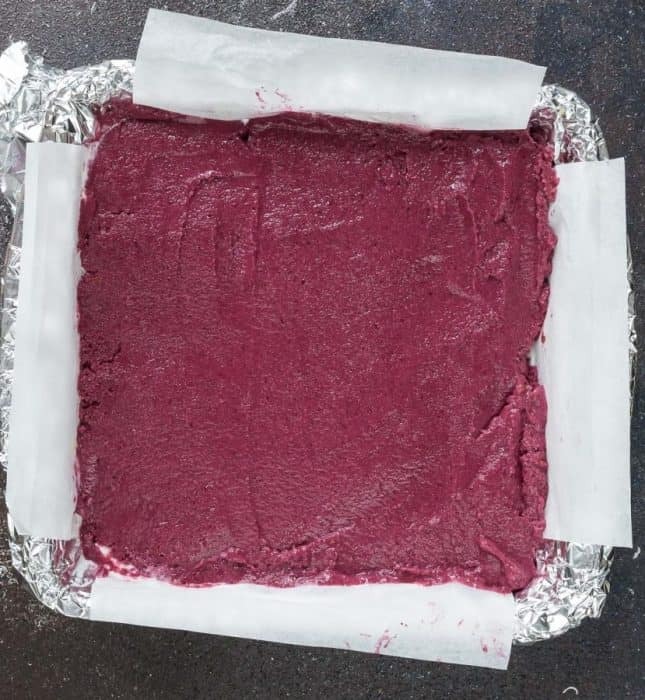 To make the blueberry powder, pulverize the freeze dried blueberries using a food processor, mortar and pestle, or plastic bag and rolling pin. We want the powder to be fine. Around 1 ounce of freeze dried blueberries will yield 3 tablespoons of powder. ***To ensure even layers of the ice cream, place the pan back in the freezer for about 10 minutes after adding each layer.